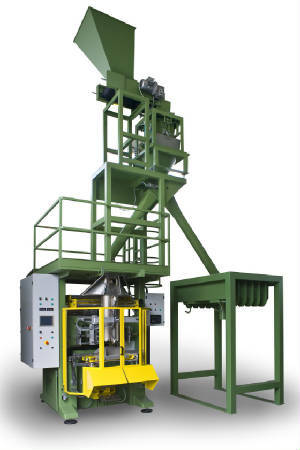 Ask Us About Pellet Packaging (Bagging) Systems! "BioSat - Making Innovation Work"
The top left photo shows a B&C AUTOMATIC MACHINERY Model CV-3080 with overhead weighing unit, form-fill-seal packaging system, combined with adjacent super sack filling. This automatic VFF&S system utilizes flat, printed poly film, and/or "eco-friendly", PAPER foil, on a roll, affording less packaging costs than pre-printed poly bagging systems. *We can also equip the CV3080 to bag decorative bark mulches, especially if you de-bark "green logs" for pellet production - TWO machines in one! For a THREE in ONE machine, we could also design the system with a compression ram for baled wood shavings as well! NOTHING LIKE THIS IN NORTH AMERICA! 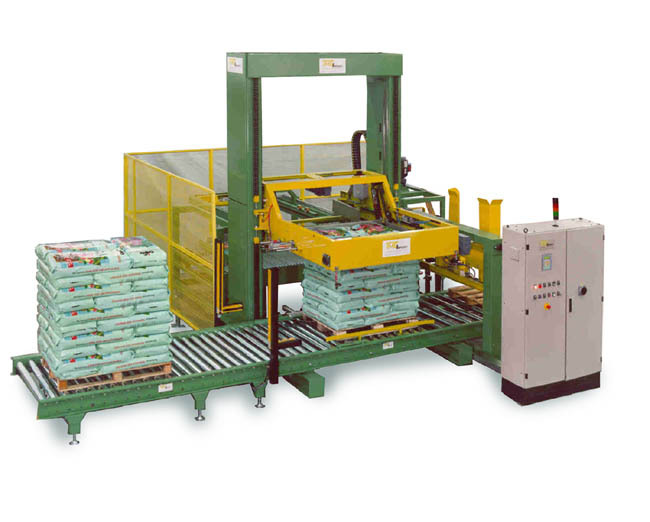 The photo (right) shows the highest speed, low-level, automatic palletizer available, and can be equipped with automatic empty pallet and slip sheet dispensers, along with powered infeed and discharge conveyors. We can design this system for palletizing pellets, mulches and baled shavings! Together with the B&C CV 3080, these systems would afford a nearly labor-free, automatic packaging system. PELLETIZED PRODUCTS ARE INCREASING RAPIDLY! Demand for pelletized products (wood waste, switchgrass, peanut hulls, straw & hay) is growing worldwide, and pellets are being marketed for home and industry heating and power generation. In addition, pelletized products are also used for equine bedding and cat litters, barbeque flavoring and other absorption applications. Successful entry into this growth industry, or upgrading to more automated systems, requires experienced engineering and design for both the pelleting and packaging processes. Consult with an experienced professional, such as CREATIVE PACKAGING INC., which brings you over 30 years of experience, and for the past 20+ years has supplied pellet packaging to North American companies such as: Arends Grain, Atlas Pellets, Bayou Wood Pellets, Elkorn Industries, Bear Mountain Pellets, Catamount Pellets, Cubex, Dry Creek Products, Energex, Eureka Pellets, Fiber Resources, Forest Energy, Future Fuels Chemical Co, Great Lakes Renewable Energy, Hamer Pellet Fuel, Manke Lumber, Modular Energy Corp., Nature's Earth Products, New England Wood Pellets, Pike's Pellets, Piney Woods Pellets, Pope & Talbot, Princeton Co-Gen (Eagle Valley Pellets), Shaw Resources, Somerset Hardwoods, Tierra Alta Pellets, Wood Pellets Co.